Mushkin says it's designed this drive with 3D MLC flash, which should offer a good mix of performance and affordability. 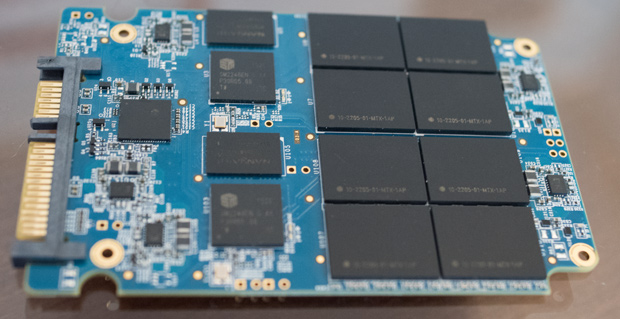 Mushkin couldn't tell us where it's sourcing that flash, but it does say to expect a cost of about $0.25 per gigabyte when this drive hits shelves sometime in Q2 this year. How do you increase drive capacity further when your controller tops out at 2TB? By using JBOD. To construct a 4TB drive, Mushkin is basically putting two Reactor 2TB SSDs on a single PCB. Those drives are then joined into a JBOD with a separate controller. This dual-drive solution will function as a single volume, but spanning drives isn't without its costs. Mushkin tells us to expect random read and write performance of about 10K IOPS. This jumbo-sized Reactor could do well in applications that tend to be heavy on sequential workloads, like video recording or bulk media storage. This formidably sized drive hasn't been formally named just yet, but we do know that it may be relatively affordable. Mushkin is targeting a $500 price point for this massive SSD when it becomes available after the release of the Reactor 2TB. This SSD certainly hits a nice pricepoint cramming in 4TB of SSD space in a single drive for only $500 USD, but the idea of it isn't as appealing to me as would be a drive with a faster throughput spec than just SATA III. An SSD of this size definitely needs SATA Express compatibility and speeds, as well as an alternative of just slapping two different PCB's together using JBOD on a unified PCB - this is the point where you have to wonder about the reliability ratings of each individual side of the PCB since it's dual drives in a single enclosure. The option of perhaps reducing the SSD storage to 2TB and giving you the hardware option of RAID 1 would be something completely different though, and would definitely give this drive an advantage over other SSD options on the market right now. I would expect Mushkin to come up with a solution that could unify all of the NAND into a single bank of chips and increase IOPS all around (that is if they can come up with a good quality controller chipset). If things came down to it though, I would probably be more intersted in dual 2TB SATA III SSDs versus a single 4TB drive in that configuration since you'd end up with the same reliability ratings as well as benchmarks. The term "never put all of your eggs in one basket" comes to mind. Of course, this is just all personal opinions and could definitely be a worthy contender in the SSD market especially for people who need that kind of storage quickly such as video production and such. Mushkin tends to be a pretty well-liked company with solid hardware though, and I actually use a Mushkin ECO2 SSD in this very laptop I'm using right now and it gets stellar benchmarks and has given me no problems at all. In the end, I can see a few areas where buying 4TB of SSD storage at this price point could definitely be advantageous to end users....but not all SSD users. And what is the Bit Error Rate on this drive? I sure hope they through everything in terms of data protection at this capacity. Capacitors, RAID, multipath, single-bit/double-bit/flip-bit/etc CRC, et al. PCIe 4X would be great to move this much data around, too.